Buffet breakfast, on time you our assistant will pick you from hotel and transfer to Airport to board the afternoon flight to Visakhapatnam, a coastal town just south of Orissa, where we’ll spend the night. Visakhapatnam, also known as Vizag, is the largest city in the Indian state of Andhra Pradesh and the third largest city on the east coast of India. It is a port city on the southeast coast of Bay of Bengal and often called as The Jewel of the East Coast and the City of Destiny. We drive up through the hills and into Orissa. We will stop at the tribal market town of Similiguda. 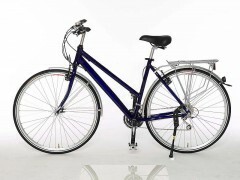 In the afternoon we will have time to put the bikes together to get them ready for tomorrow’s ride. Once Semiligua was a small village in dense forest, inhabited by the native Koraputiya. With the development of the two townships near by Similiguda it has now become one of the best tourist place in Koraput district because of its natural beauty. 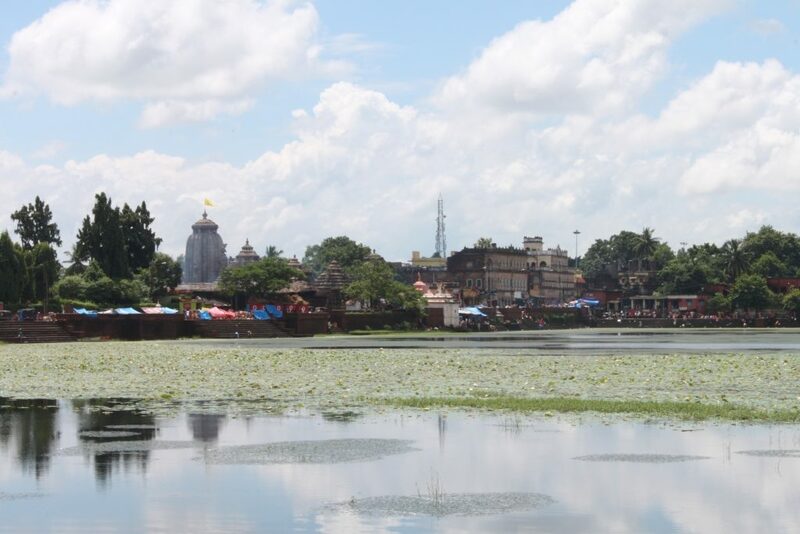 It has many temples including Shiva, Ganga, Hanuman, Tarini, Durga, and Rama. We stay overnight in Similiguda. Today we will ride through the heart of Orissa’s tribal area. People native to this area are from Pajara tribes. The most of part of terrain is green and fertile. The riding to the hills delightful view over undulating hills. 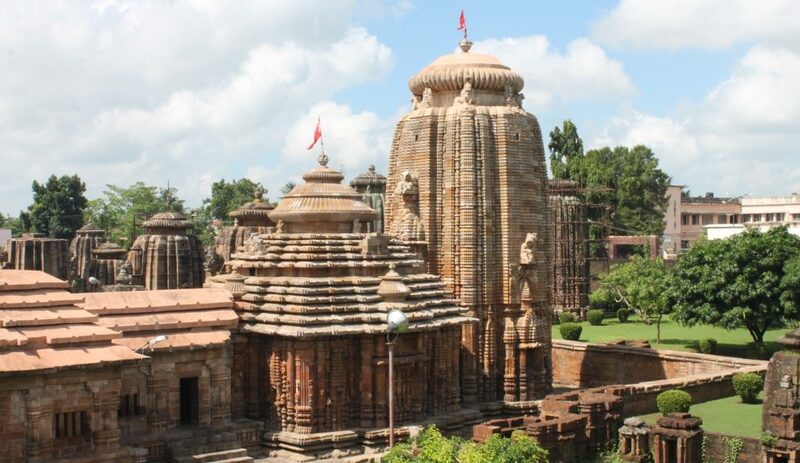 We visit the Tribal Museum, Jagannath Temple (Sanctum Sanctorum allowed for the non-Hindus). We continue our drive to Rayagada (110kms) through the Ghats, which has beautiful scenic roads. Cycling from Similiguda to Koraput is about 40kms. The hilly region from Bansadhara and to Nagabali is famous for spices. We stay overnight in Rayagada. Today we will be riding to meet the Kutia and Kondh Tribal groups of Odisha, The Kondh Tribe is one of the most beautiful tattoo faced Tribe. We are able to spend some time at one of the Schools at Kotgarh to interact ourselves with the children. From here we will drive back to Rayagada. A village panchayat Tumudibandh is located in the Kandhamal district of Orissa state. The native language of Tumudibandh is Oriya and most of the villagers speak Oriya. We stay overnight in Tumudibandh. 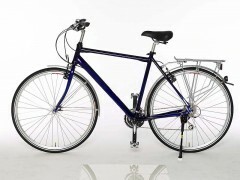 Today we start Cycling to Chatkona market. This is a colorful weekly market of the Dongariya Kondh Group. (Approx 40 kms cycling). This tribe is one of most ancient tribes of the Kondh’s and they live in the high slopes of the Niyamagiri hills. These people are cultivation of fruits and vegetables. The tribe grows fruits such as oranges, pineapple and bananas. Here onward we continue driving to Taptapani (87 kms) which the land of Saura people and through dense forest on ghat roads. The Taptapani is famous for hot water considered to have medicinal properties and can be bathed in at the pond created next to the hot spring. We stay overnight in Taptapani. We visit the Chandragiri Tibetan Settlement in Taptapani . (Approx. 43 kms cycling). The wildlife elephants, leopards even spotted deer and peacock all seen crawling in this area around Mahendra Giri Hill. Today being the last day in the forest and we come out of Orissa’s to the coast of Gopalpur, one of India’s neat and clean beaches and it also a great place to relax after our long ride. Gopalpur have the commercial port which now lying in ruins. A visit of little fishing village of Gopalpur. The East India Company built large warehouses for trading point for rice from Rangoon. We stay overnight in Gopalpur. You are at leisure in Gopalpur. We have a chance to relax and recharge for rest of cycling still to come. 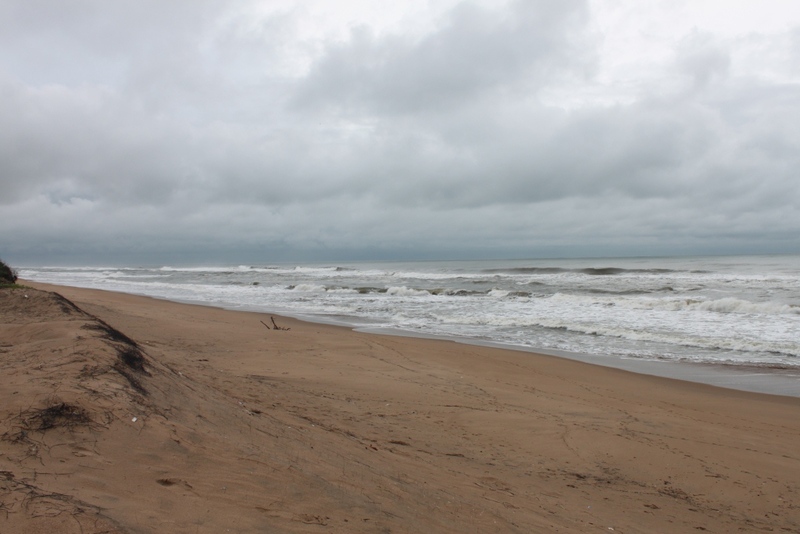 Gopalpur has a fantastically laid back atmosphere –the tears may come leaving Gopalpur. The beach with its golden sand of the blue sea has its own sleepy charm. The beach is a very quite and comparatively clean place to swim and sun bathe, but take precautions because of treacherous undercurrents. On our way to North in the first part of the day we will see the coast hugging us. And in the second part after lunch we turn slightly inland and follow the banks of Chilka Lake. This is Asia’s largest lagoon and will find another lake as Barkul. 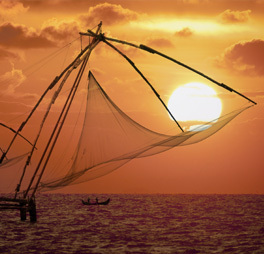 Balugaon is a small town mainly situated on the bank of Chilka Lake, which is known for exporting fish from Chilka Lake. From here ferry services are available to cross the lake and other places nearby. On top of the hill there is a temple dedicated to Goddess Kalijai, which was built by ex-Raja of Parikud. The goddess is highly respected by the local people, particularly by the fishing community. 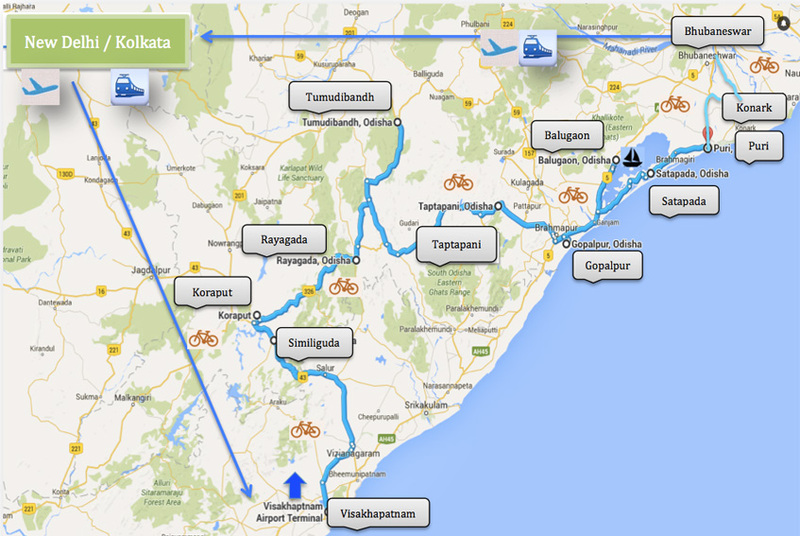 We will start by Ferry to Satapada and cycling to Puri (55kms) A ferry will take us the 15 kms across Chilka Lake. It’s a paradise of migratory birds and can see the dolphins along the way as well. The ride to Puri is a real luxury as we past picturesque rice paddies, fish farms and tiny villages. Puri is famous for “Ratha Yatra” or “Festival of Chariots”, the deities Jagannath, Balabhadra, and Subhadra, are brought out of the temple, and placed in a chariot procession. This festival occurs typically in the month of July. In the morning we visit Jagannath Temples from outside. A must-visit to Puri before we move on. It is one of the four most important Hindu pilgrimage centers in India. A short, scenic ride along the coastal area takes us to Konark which is located at a mere distance of 34 kms from the holy city of Puri. 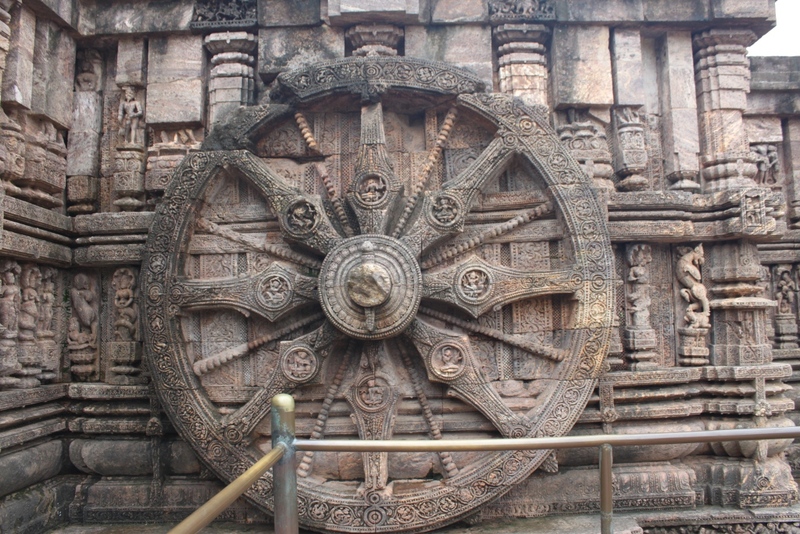 Konark derives its name from ‘Konarka’, the presiding deity of the famous Sun Temple located here. 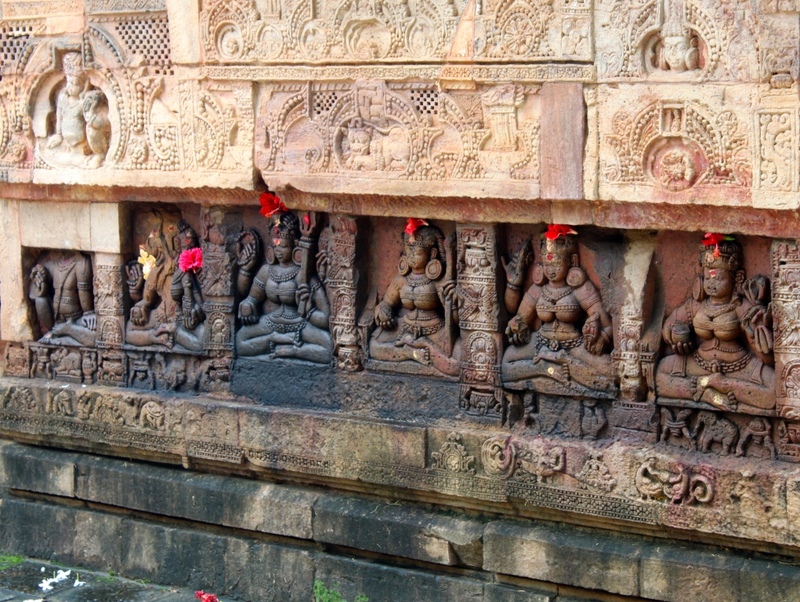 From Konark it be an interesting excursion to Karuma which is a very small village spread around 8 kms from the city and is famous for Buddhist architectural heritage. Kakatapur, another popular pilgrimage destination of Odisha (Orissa) housing a number of shrines dedicated to Goddess Mangala and Ranadurga. 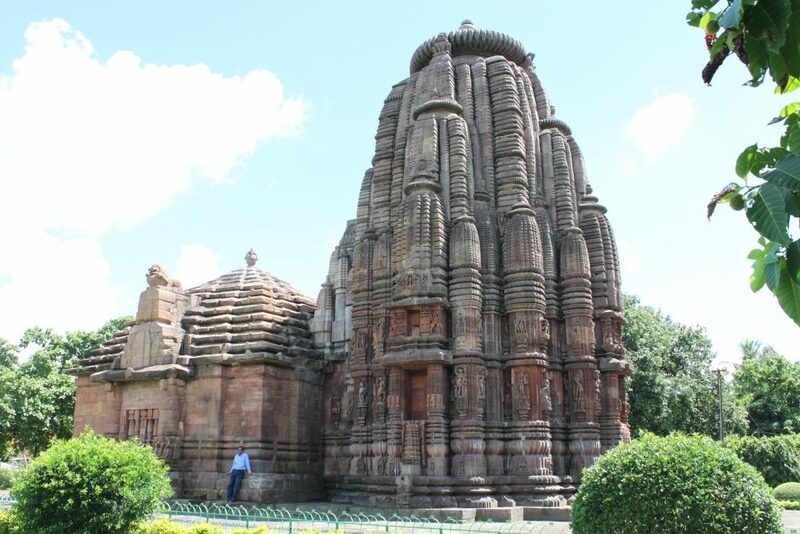 Visit to temples in the morning and then cycling to Bhubaneswar via Dhauli and Pipli. 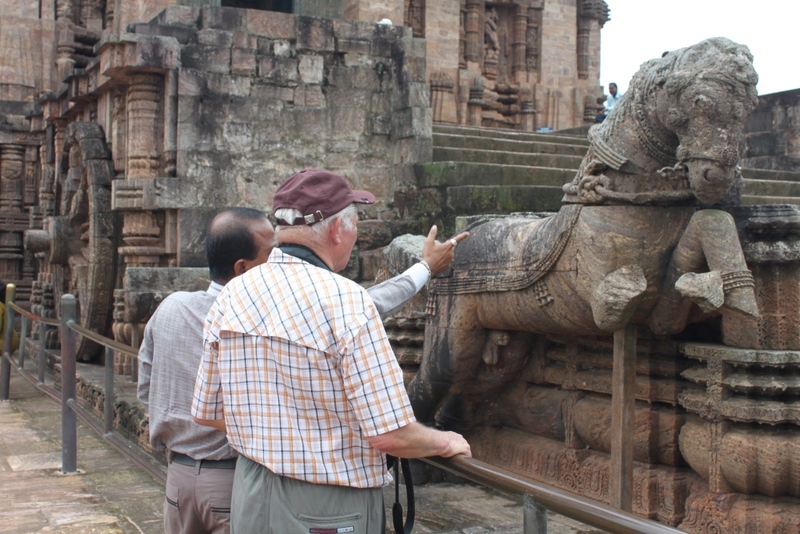 We will have a look at the Sun Temple at Konark as mark of good look before last ride of the tour. The first point is Pipli that is famous for its amazing appliqué textile work. Pipli is a demonstration of colours, eye-catching to say the least! From Pipli the ride is short to Dhauli, the amazing 3rd Century rock edicts of King Ashoka. 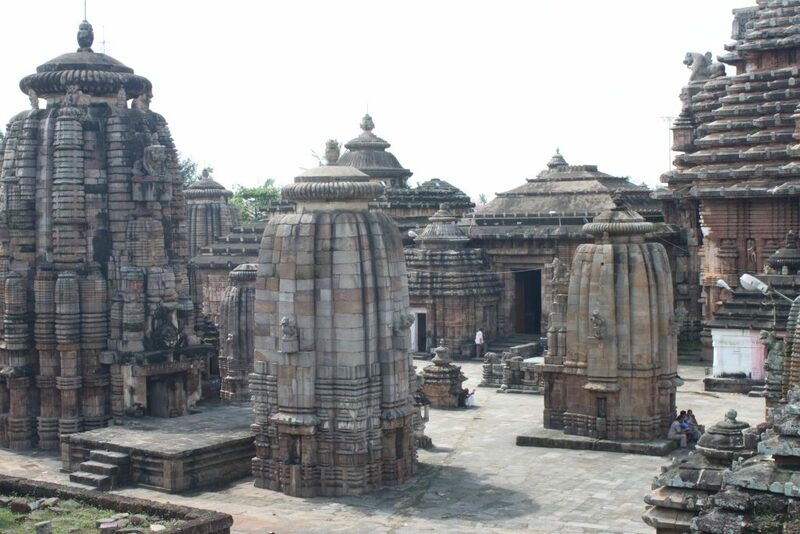 Lastly we reach Bhubaneswar, the capital of the Odisha, formerly known as Orissa. 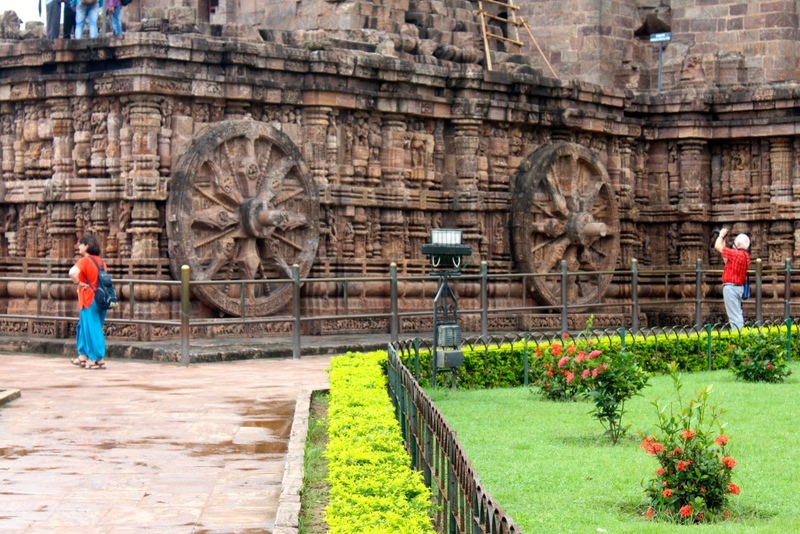 Today you have full day sightseeing of old and new in Bhubaneswar. The city’s history dates back 2,000 years. We will visit State Museum - (closed on Mondays). Visit to Museum of Man, also known as the Tribal Research Institute, (closed on Sundays). Then to Modern Art Gallery, which has the aim to promote contemporary Orissan art. There has been collection of work in oil and water, sculptures, serigraphy, etching, lithography and woodcarvings at the Gallery at Surya Nagar. After dinner on time transfer to Railway Station to board the overnight train to Kolkata. Upon arriving Kolkata Railway Station transfer to hotel. On time transfer to International Airport to board onward flight. Our services conclude in Kolkata.